The largest of all lynx species, the Eurasian Lynx is a secretive and beautiful cat. Bigger and more spotted than its Canadian counterpart, it varies in length from two and a half to four and a half feet and weighs between forty to seventy pounds - with males being larger. Coat varies across the terrain with dark red to grayish coloration seen across various habitats. Pattern of markings also differs with three variations recognized - striped, spotted and unpatterned. Like all other lynx species, the Eurasian variety has a prominent facial ruff, dark ear tufts and a short black-tipped tail. Legs are long and paws are large and covered with fur - acting as snowshoes and assisting the cat in treading across its terrain. Capable of taking down a variety of animals, the Eurasian Lynx has a wider prey base, unlike its Canadian cousin that relies chiefly on the hare. The former takes down a range of animals including hare, rabbit, fox and deer. It is reported that the cats are able to hunt prey animals three to four times their own size. Chief hours of activity are in early morning and evening. Stalking and pouncing is the generally preferred hunting technique with the lynx preferring densely forested habitat for staying - making it ever more elusive. Historically the range of Eurasian Lynx has shrunk. Whereas earlier it was seen throughout Europe and much of Asia, it is now seen in selected territories, though successful reintroduction and hunting embargoes have brought back the resilient cat in many countries. As per its distribution various subspecies are recognized. Mating season of Eurasian Lynx is between February and April. An average of three kittens are born after a gestation period of nearly seventy days. The babies achieve independence at around ten months of age. Lifespan in the wild is up to seventeen years. Even though as a species the Eurasian Lynx is not threatened, it is vulnerable in certain parts of its range. Principle threats include destruction of their prey base, habitat, pelt trade and conflicts with farmers that result in the cats being hunted. Absolutely stunning. Thank you so much for sharing those pictures and the info. We love learning about other pooses from your blogs. What a lovely cat the lynx is. i needed this for a project thank you so much for all the info!!!!!!!! Eurasian lynx are so awsome!!!!!!!!!!!!!!!!! 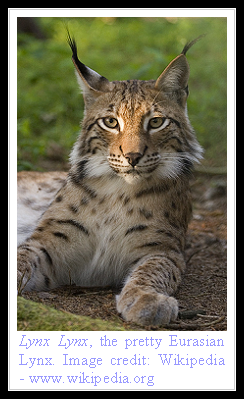 i still think eurasian iberian canadian lynx and the bobcat lets not 4get are in need of help. this helped me 4 a report!!!!!!!! this didnt really help me alot needs more info!! just seen lynx lynx lynx in Estonia,such a beautiful sight, we feel very privilaged. I thank you very much for posting this Information for us viewers to use, for that I thank you very much. they are ginger ninjas...I LOVE THEM! Good grief this is good! Wow! The species look so cute!